Michels’ expertise in location based services will support the company’s exponential growth. Atlanta, Ga. – Gozio Health is pleased to announce the appointment of Marc Michels as Chief Strategy Officer. Michels was selected to expand market share and build a solid partner ecosystem for the high growth technology company as it expands it’s enterprise services to healthcare systems nationwide. Michels has over 20 years of experience in information technology with an emphasis on enterprise-wide software and IoT solutions in the Americas and EMEA. As a renowned mobility, LBS and Real Time Location System (RTLS) subject matter expert, he brokered one of the largest RTLS contracts in the healthcare industry and the world’s first indoor navigation system in a hospital. Previously Michels has held executive leadership positions with Acuity Brands, Jibestream, Phunware, Meridian, Ekahau and AwarePoint. A graduate of the Munich Business School in Germany and McGill University in Montreal, Michels also co-authored a patent on manufacturing practices and a mobile application. 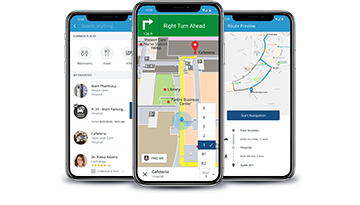 Gozio, Inc. transforms indoor navigation and significantly improves patient experience with a smartphone-based, indoor positioning and wayfinding platform specifically designed for hospitals and healthcare systems. Gozio’s pioneering mobile platform dramatically improves mobile adoption rates for hospitals and seamlessly integrates mobile technology into patient engagement strategies. In addition to numerous industry awards, the wayfinding solution from Gozio has earned the exclusive endorsement of the American Hospital Association. For more information, visit www.goziohealth.com, or find Gozio Health on Twitter and LinkedIn.